Handmade signs are seen attached to a road closure sign on October 16, 2017 in Oak Knoll, California. As firefighters gain on wildfires burning in Northern California's wine country, the many thousands who lost their houses, condos and apartments in those fires will have to find a new place to live in one of the toughest housing markets in the nation. In San Francisco, an average one-bedroom apartment rents for more than $3,000 a month and the median home price is about $1.5 million. The climbing cost of living has reached the greater San Francisco Bay Area, which includes parts of the fire areas. The fires that swept through parts of seven counties were the deadliest and most destructive series of blazes in in California history. At least 42 people were killed and 6,000 homes destroyed. Crews made excellent progress Tuesday night and Wednesday morning, setting off controlled burns to deprive wildfires of added fuel, said Daniel Berlant, spokesman for California Department of Forestry and Fire Protection, also known as Cal Fire. He said cooler weather and the lack of wind helped. "We're hoping that Mother Nature will continue to cooperate with us," he said. "Increased moisture in the air and potential rainfall, all of those are welcome signs." Also on Wednesday, Sonoma County increased its death count from 22 to 23 when officials reported they had found another body in Santa Rosa. Officials released no details. Keeping positive is hard when facing the reality of starting from scratch, said John De Groot, whose home in Santa Rosa burned down along with a lifetime of memories. "We've worked our whole lives," De Groot said. "We've had this house for 23 years. So there are a lot of memories there. Grandkids have been there. They love it. And it's not there. So now what?" California, which was grappling with a housing shortage before the wildfires broke out, is faced with a massive logistical issue with entire neighborhoods destroyed and so many seeking to rebuild. "This is a tremendous event for an urban area," Brock Long, an administrator with the Federal Emergency Management Agency, said Tuesday. "We've got a lot of thinking to do about how you mitigate this from happening in communities down the road and becoming more resilient." An estimated 100,000 people were evacuated at the height of the fires, and about 34,000 remain under evacuation. Many have yet to find out if their homes are still standing. "The good thing is we have each other," said Ramona Lancu, whose family home in Larkfield was destroyed. "We were able to escape. Now we just start a new life. It's hard." Lancu was among tens of thousands who have drifted home to find their lives and their communities dramatically altered. At a Red Cross shelter in Petaluma, 69-year-old Sue Wortman recalled the words that raced through her mind when she fled the flames near her home in Sonoma. "We're all going up in smoke," she thought at the time. Since then, she's been walking around in a daze. Firefighters gained more control Tuesday of the massive wine country wildfires, even as other blazes erupted in mountains near Los Angeles and Santa Cruz. Meanwhile, officials and trauma experts worried about the emotional toll taken by the grueling week of blazes. Wortman has been living in her RV outside the Petaluma shelter, while hundreds of other evacuees sought refuge in tents and trailers and on cots inside the fairground facility. She has sought comfort among friends and with her dogs but knows that feeling won't last. "I think it's really going to hit when we go home and see the destruction," she said. Highlighting the concerns of mental health professionals, the California Psychological Association has emailed an urgent request calling for volunteers to help wildfire evacuees cope with the trauma they have faced and its aftermath. 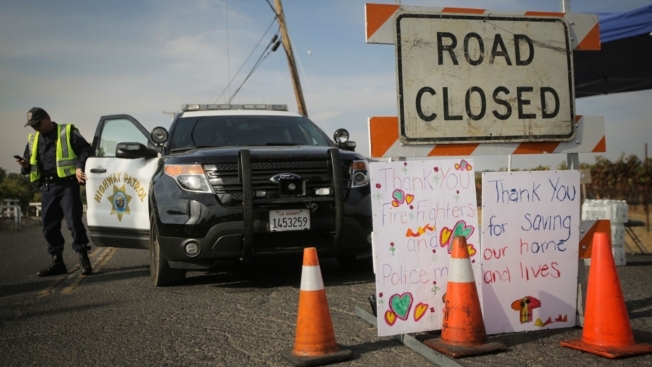 "There is tremendous acute and long term impact and we are needed right now to help," Dr. Chip Shreiber, the association's disaster resource coordinator, said in the email sent Monday to a distribution list of 13,000 licensed psychologists across California. "Please get the word out." It's common for survivors to feel a range of emotions — sadness, anger, irritability — and to suffer flashbacks or nightmares while having trouble sleeping, especially in a shelter surrounded by strangers. Evacuees were advised to pace their exposure to news and media, which provide information that can reduce anxiety but also become overwhelming. Associated Press writers Ellen Knickmeyer in Sonoma, Terry Chea in Santa Rosa, Jocelyn Gecker and Janie Har in San Francisco, and Andrew Dalton and Christopher Weber in Los Angeles contributed to this report.